We’ve all heard a frustrated owner calling this in the park. And what’s Fido doing all this while? Probably carrying on just as he pleases. When the torrent of yelling subsides he’ll look round to check his owners are still there. And if they start walking away, he just may come. But this is isn’t what you’re wanting, is it? We’d all love to have a dog who spins on a sixpence as soon as he hears his name, and powers back to us at tremendous speed. We want people to see that our dog loves and respects us, and we certainly want to be sure he doesn’t make a nuisance of himself. So how can you change this? The first thing to do is to change what you’re doing. Then you can change what your dog is doing. So when you say anything to your dog, you ONLY SAY IT ONCE. He gets one chance to get the reward from you. You have got a super high-value reward with you at all times, haven’t you? Sausage, or salami, hot dog - whatever your dog thinks is heavenly. If he ignores your ONE call, then the reward is gone. Ok, you’re saying, how is that going to get my dog back? Well, you start with this in the house - in an area where you have little distraction and you know that if he doesn’t respond you can go over to him. This isn’t a capitulation on your part. It’s expedient. We’re not looking at who’s the boss - that won’t make things any better. Dogs do not have a secret agenda to rule the world, your household, or you. Dogs do what works, and if it works - then that’s going to make you both happy. So you say your dog’s name ONCE. He looks at you - YES! here’s your reward And as I explain elsewhere, a reward is anything your dog finds rewarding: food (top of the list), cuddles (fairly far down the list), game, dinner bowl, lead on for a walk, etc. Dogs learn by repetition and patterning. So it’s a case of repeat, repeat, repeat. (But don’t repeat his name!) Just get into the habit of saying your dog’s name ONCE and rewarding his instant response. So say “Fido!” and zip it. Some people actually find it helps them to remember when they say something to their dog to put their hand over their mouth! Whatever works for you. I’ve heard some mothers complain that they call the family down to dinner and get “just coming” ten times before they all eventually appear at the table. If those mothers called the kids ONCE, then - after a suitable delay - tipped their dinner into the bin, I think the next day they’d start getting a faster response. This is the same principle. When I say your name, there is a reward on offer. You don’t respond? Reward is gone. Over time (not necessarily a very long time, either), your dog will leap to attention when he hears his name. He doesn’t want to miss that treat! Once you’ve got that working well indoors, you can start trying it outdoors - in a distraction-free zone to begin with - and in an area where you can go to your dog if he doesn’t come to you. When you go to him, you are not arriving like Thor firing thunderbolts. Rather you just get right up next to your dog and call him once from there. Then you reward him! Why? Because he responded to you! The simple answer to this is: go back to the drawing board and start in the house (where your dog cannot run off) and - critically - make it fun for your dog. If the sound of your dog’s name always means fun and games, why would he not come? You’ll need to ditch any ideas you may have had about being the boss, expecting instant obedience, punishing defiance, and so on. If you ask your partner or child to fetch something for you, do you expect them to leap instantly from their chair, abandon what they’re doing, and rush to obey? No! Much more likely you’ll get “In a minute,” or a slower heave out of the armchair. This is fine. This is normal. This is what we expect (and accept) from our housemates. 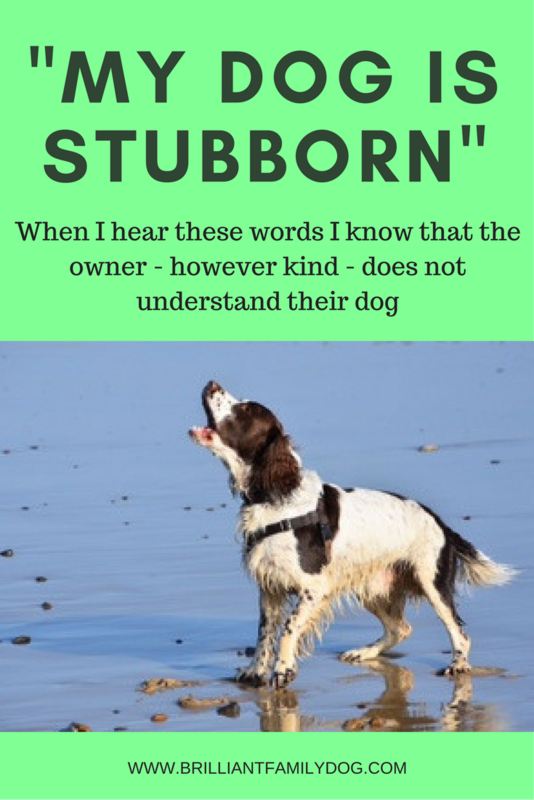 Why should we expect something totally different from our dog? By the way, ONLY SAY IT ONCE works with anything you say to your dog. So no more “Sit, sit sit, siddown, I said sit”, “Leave it, put it down, leave it, LEAVE IT!” and so on. This is a habit you’ll have to change in yourself before you can expect any change in your dog. For your dog to change - you have to change. So, discipline your mouth, be ready to cover it with your hand as soon as you’ve uttered, and practice saying things only once then zip it! Focus on this for just five days this week. Every single time you address your dog, you’ll say something ONCE then zip it. See how soon the turning point arrives and your dog starts listening to you! You can comment below and tell me when it happened for you.